The Geography and Map Division of the United States Library of Congress is the largest repository of cartography and related forms of geographic representation in the world. Its collections include more than five million maps and tens of thousands of atlases. It also holds the archives of many important cartographers and geoscientists and manuscript materials related to mapmaking that date from the late 13th century through the modern era. Recently, the library has undertaken a large-scale project to collect materials, technical information, maps, and algorithms from the earliest days of computer cartography. This project, which is being directed by the author, and which began as a series of lectures for graduate students at Johns Hopkins University, has resulted in the library’s acquisition of a number of important archives from the earliest days of computer cartography. One recently acquired archive, of personal papers related to the development of geographic information systems, was that of Dr. Nicholas Chrisman. He was one of the many imaginative geographers, mathematicians, and computer scientists working at the Harvard Laboratory for Computer Graphics and Spatial Analysis during the time in the 1960s and 1970s that saw the beginnings of what would become modern GIS. 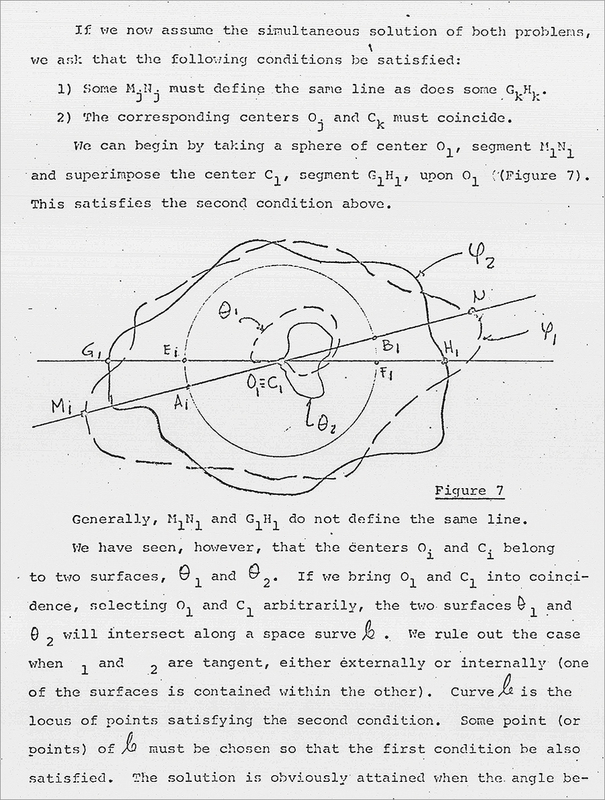 The research at the Harvard Laboratory was a cross section of geographic ideas circulating at the time, and Chrisman’s archive contains his notes, computer programs, and papers, including most of the official publications from the laboratory. One set of papers in particular, which deserves much more attention from today’s mapmakers, historians, and those interested in the foundations of current geographic thought, is the Harvard Papers in Theoretical Geography. 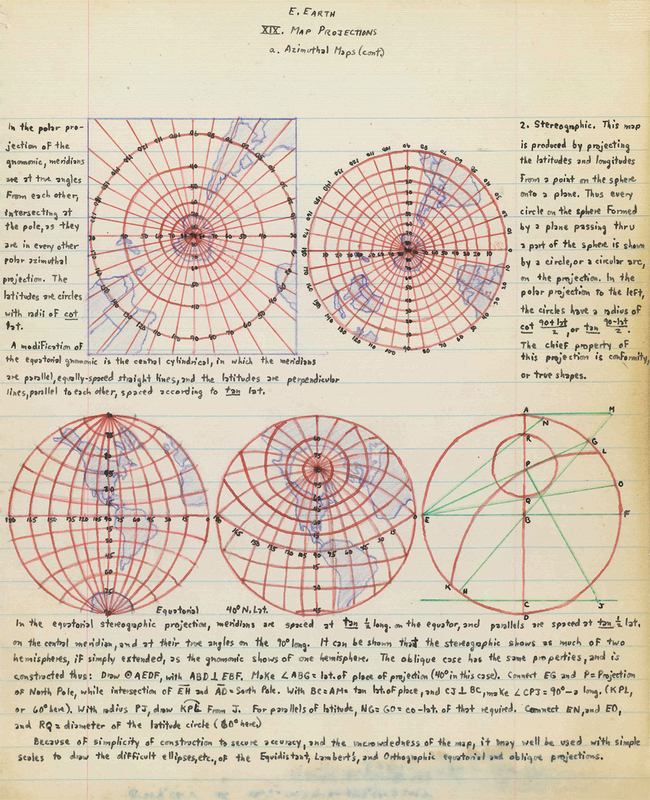 These papers, subtitled, “Geography and the properties of surfaces,” detail the lab’s early experiments in the computer analysis of cartographic problems. They also give insight into the theoretical thinking of many early researchers as they experimented with theorems from algebraic topology, complex spatial analysis algorithms, and various forms of abstract algebras to redefine the map as a mathematical tool for geographic analysis. Reading some of the titles in the series today, for example, “Hyper-surfaces and Geodesic Lines in 4-D Euclidean Space and The Sandwich Theorem: A Basic One for Geography,” gives one a sense of the experimentation and imaginative thinking that surrounded the breakthroughs necessary for the development of our modern computer mapping systems. The Harvard Papers shows in stark mathematical detail the multidisciplinary thinking that surrounded many of the lab’s projects. In an attempt to answer previously intractable geographic and cartographic questions, purely mathematical and geometrical concepts, like existence theorems, whose basic logical structure contains statements that confirm or deny the existence of particular sets of objects, were employed in various computer mapping schemes. The development of these programs injected high levels of topological and algebraic abstraction into geographic analysis and fundamentally changed the basic ontology of geographic and cartographic objects. However, although existence theorems provide logical proof for whatever mathematical entity they are claiming existence for, they do not necessarily provide a way to find or calculate those objects. The authors of these papers, of which 57 were produced, and all of which have been collected by the library, look to us now like a who’s who of the analytic turn that geography took in the post-World War II era. William Warntz, Ernesto Lindgren, Michael Woldberg, Waldo Tobler, Donald Shepper, Carl Steinitz, William Bunge, and Geoffery Dutton are just a few who added their insights and ideas to this highly theoretical series of papers. Aside from the technical aspects that archives like this reveal, they also show deeper connections with cultural and intellectual history. They demonstrate how the practitioners and developers of GIS found themselves compelled to draw both distinctions and parallels with ideas that were appearing in the contemporary scholarly literature on spatial and temporal reasoning. Their explorations into this literature was not limited to geographic ideas on lived human space but also drew on philosophy, cognitive science, pure mathematics, and fields like modal logic—all somehow to come to terms with the diverse phenomena that have spatiotemporal extent and that might be mapped and analyzed. Because of these deeper connections, the Library of Congress is collecting quite broadly in the area of early computer cartography. It has obtained many other archives from cartographers like John Parr Snyder, who was the original developer of the space-oblique Mercator projection. It was Snyder who developed the equations for this extremely complicated projection using an early Texas Instruments programmable calculator. It is his equations for the projection that first allowed remote-sensing imagery from the earliest Landsat satellites to be made into low-error maps. In thinking through the geometry of the projection, Snyder had to take into account the various motions of the satellite and the earth, and in doing so, invented a dynamic and time-dependent map projection. His archive contains all his original notes, mathematical derivations, and also his calculators and the magnetic strips that stored his original programs. In addition to the technical material, there are several notebooks into which he copied his ideas on projections when he was 16 years old and that show him to be, perhaps, one of the few modern cartographic prodigies. The study of cartography and its related geographic disciplines underwent profound technological and conceptual advancements in the last half of the 20th century. These advancements, brought about by the advent of computers, the development of newer and faster mathematical and computational algorithms, and the birth of satellite imagery, contributed to paradigm changes that can be considered revolutionary. Technological and conceptual improvements have generated new forms of data, maps, and artifacts that differ radically from those typically archived in map libraries. In the future, these new artifacts and materials will form the basis for the study of modern cartography and as such, their collection and preservation present new challenges to the archivist and the map librarian. The Library of Congress’s program of collecting computer software, new computational devices, hardware, and new forms of geospatial data is based on the assumption that all these need to be preserved in a way that allows future researchers to access not only data but also the techniques, data structures, and algorithms used by today’s mapmakers. Many of these ephemeral materials are disappearing, through either obsolescence, scholarly neglect, or the inevitable degradation of all magnetic media. These fragile parts of our history need to be collected now, before they disappear, for even though we are talking about materials from the recent past, the one thing we do not have in the preservation of this history is the luxury of time. John Hessler is a specialist in Modern Cartography and Geographic Information Systems in the Geography and Map Division of the Library of Congress and teaches the history of cartography at the Johns Hopkins University. The author of many books and articles, he is currently working on a forthcoming book, Cartography in the Age of Computer Simulation: Lectures on the Historical and Mathematical Foundations of GIS. For more information, contact John Hessler, Library of Congress.